WE are all sick of reading the same old stuff, week in week out. I probably only have to give you one good reason to read a good Bent Banana Book, a book which is different. But I am a generous sorta bloke and I will give you 7. No, I’ll giveya 7, cuz. .Everyone knows 7 is a lucky number. Well, you know that is not quite true though they tell me 7 is a lucky number in both oriental and Christian religions. The Hollywood movie 7 was quite good, though it never became clear why it was called 7. George Costanza said on an episode of Seinfield 7 was a good name for a baby. Jerry ridiculed him but I thought George was on to something. 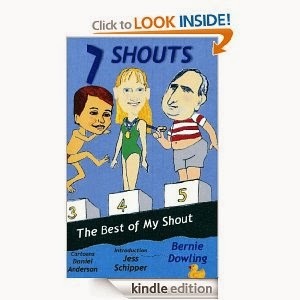 There is enough evidence that 7 good reasons exist to buy a book called 7 Shouts. 1. 7 Shouts looks at separating history from humbug and urban myths from reality. The weekly My Shout columns are yet to examine 7 but in the twelfth year of my column, I promise to do it soon. Did Persil Benny lend his name to a detergent company? You will never know unless you buy 7 Shouts and that question will plague your mind for the next 7 minutes. 2. 7 Shouts is funny like Seinfeld and unlike the movie 7.The book finds mirth in our everyday life and language. That has to be a good thing. 3. Puritans, the pompous and pretenders will not like 7 Shouts. It is our duty to upset such people every day. 4. Barack Obama is in it as well as Russell Crowe and at least 7 other famous people who have endorsed 7 Shouts by not suing me – yet. 5. There are 7 Books in 7 Shouts. The Books have titles such as Slanguage, Funny Side Up, Her Story and People Power. It is spooky there is no Book 8, as I went to bed after writing Book 7. 6. My good friend, ventriloquist Daniel Anderson did 9 original illustrations for 7 Shouts. If you turn 9 upside down it becomes 6 which is only 1 off 7. Spooky, really. 7. If you do not buy 7 Shouts you will probably give your money to King, Brown, Koontz, Childs, Patterson, Meyer or Evanovich and those 7 have far too much of the stuff as it is. Read the first 7 pages of 7 Shouts at http://books.google.com.au/books?id=H... and then buy it. Do this quiz to see what you know about weird and wonderful Australia. Believe it or not, as I post this, 7 people have done the quiz so far. 7 out of 20 is considered a good result. This one might be a bit cryptic for non-Aussies. It is still hilarious.